EURPMASK Adjustable Ventilated Laptop Stand---A PERFECT SOLUTION FOR EFFICIENT WORK! GET YOUR WORK DONE COMFORTABLY! Keep your laptop running cooler with this sleek-looking ventilated laptop stand from EURPMASK. With an adjustable height, the laptop stand provides a better experience for you and better conditions for your laptop. You sit comfortably with the screen at eye level thanks to the tilted angle. The degree of the ventilated laptop stand can be adjusted as needed. Raising the platform up tilts the laptop slightly forward, creating a comfortable angle for reading or typing. Whether used at a desk or on the dining table, the ventilated laptop stand can be easily adjusted for optimal comfort. With our adjustable laptop desk, you can use a laptop at your most comfortable position regardless where you are sitting or standing. 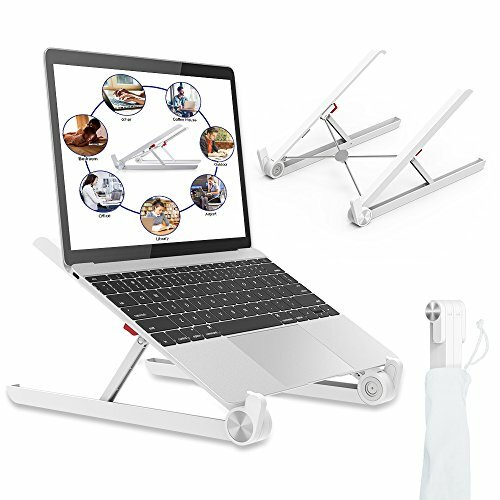 This stand raises your laptop to eye level to save your wrists and neck from terrible posture, so it will protect your body from neck pain and shoulder stress. The EURPMASK Portable Laptop is perfect when you need to use several electronic devices for your projects. Make your work space more organized and comfortable. This ventilated laptop stand comes with storage space underneath. You can put papers, notebooks and other stuff underneath, making your desk clutter-free. - Made of high quality nylon, this stand is super sturdy. It can easily hold laptops weigh up to 15kg. -Retractable supports keep your stand stable and protect your desktop surface. - Just one step for the installation. Super easy to assemble. Ergonomic Design: Easy to raises your laptop height to get the most comfortable viewing position to prevent back, neck and wrist pain. Compact, Lightweight and Foldable: Light weight just 0.6 pounds with Strengthened Nylon Fiber material. Come with Carrying Sleeve Bag for easy carry anywhere. Easy Height Adjustment: Adjustable from 26 degree to 30 degree by simply press 2 red buttons to slide down to adjust the angle of inclination. Durable and Stable: Weight support up to 25 lbs for most of 11 ~17" laptop. Additional baffle pad set included for difference thickness of laptop usage. Easy Operation and Warranty: One second quick open or close design. Improve air flow and heat ventilation of laptop during operation. Backed by 12-month replacement warranty. If you have any questions about this product by EURPMASK Choose the color of europe, contact us by completing and submitting the form below. If you are looking for a specif part number, please include it with your message.